� 2010 Soltani et al; licensee BioMed Central Ltd. This is an Open Access article distributed under the terms of the Creative Commons Attribution License (http://creativecommons.org/licenses/by/2.0), which permits unrestricted use, distribution, and reproduction in any medium, provided the original work is properly cited. Background: Little is known about airway remodelling in bronchial biopsies (BB) in smokers and chronic obstructive pulmonary disease (COPD). We conducted an initial pilot study comparing BB from COPD patients with nonsmoking controls. This pilot study suggested the presence of reticular basement membrane (Rbm) fragmentation and altered vessel distribution in COPD. 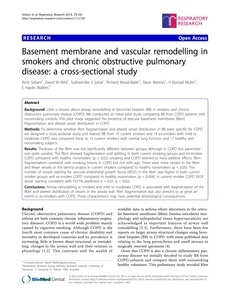 Methods: To determine whether Rbm fragmentation and altered vessel distribution in BB were specific for COPD we designed a cross-sectional study and stained BB from 19 current smokers and 14 ex-smokers with mild to moderate COPD and compared these to 15 current smokers with normal lung function and 17 healthy and nonsmoking subjects. Results: Thickness of the Rbm was not significantly different between groups; although in COPD this parameter was quite variable. The Rbm showed fragmentation and splitting in both current smoking groups and ex-smoker COPD compared with healthy nonsmokers (p < 0.02); smoking and COPD seemed to have additive effects. Rbm fragmentation correlated with smoking history in COPD but not with age. There were more vessels in the Rbm and fewer vessels in the lamina propria in current smokers compared to healthy nonsmokers (p < 0.05). The number of vessels staining for vascular endothelial growth factor (VEGF) in the Rbm was higher in both current smoker groups and ex-smoker COPD compared to healthy nonsmokers (p < 0.004). In current smoker COPD VEGF vessel staining correlated with FEV1% predicted (r = 0.61, p < 0.02). Conclusions: Airway remodelling in smokers and mild to moderate COPD is associated with fragmentation of the Rbm and altered distribution of vessels in the airway wall. Rbm fragmentation was also present to as great an extent in ex-smokers with COPD. These characteristics may have potential physiological consequences.